I first became interested in the tropical hibiscus plant (Hibiscus rosa-sinensis) in the 1970s when I lived on the campus of the University of Ibadan, Nigeria. Hibiscus were to be found growing in many of the gardens of resident staff throughout the campus. One could not fail to be aware of these plants because of their beautiful, conspicuous red flowers which attracted much interest and delight, especially from the ladies. Indeed, I was to learn that the next best thing to a diamond necklace to make a lady go weak at the knees is a freshly-picked hibiscus flower. For a long time the flower has featured as a necessary adornment in the hair of bikini-clad tropical maidens of every hue. A teacher at the University staff school mentioned one day that there was a hibiscus plant with white flowers growing in the school grounds. I found this hard to believe – after all, everybody knew that hibiscus flowers were red. However, the lady insisted and told me to go and take a look for myself. I did – and indeed there was the hibiscus, bearing beautiful, pure white flowers! I made cuttings from the stems of this white-flowered hibiscus and planted them in a prepared plant bed in a secluded area of the University Zoological Garden, just behind the pygmy hippo enclosure. This being the first time I had attempted this, I had no idea if the cuttings would take root. The garden staff and I fussed over them, watered them and kept checking them and at least they seemed to stay alive. Then, after three or four weeks, it became clear that most of the cuttings had indeed rooted. They first produced tiny green leaves and after a few months we removed them carefully and planted them in individual pots. I was delighted! So, by the way, were the pygmy hippos; the hippos hadn’t shown the slightest interest in our hibiscus propogation project and had made it clear that they greatly resented the daily appearance of the noisy, chattering gardeners behind their enclosure. After all these years, I still have one of those original cuttings growing in my hibiscus conservatory in Bristol, England. It produces its white flowers every summer and constantly reminds me of my long ago life in Nigeria. 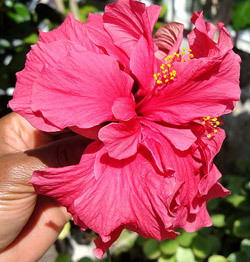 There is a photograph of this flower in the hibiscus Photo Gallery – see the link on this page. I also remain aware that this plant – ‘single white, Nigeria’ as I have labelled it – sparked the development of what now appears to be the largest collection of Hibiscus rosa-sinensis in the UK. I would be pleased to hear from other growers on this latter point. I began to learn a little more about the hibiscus plant. The tropical hibiscus of today is named Hibiscus rosa-sinensis and is said to originate in south-east China and perhaps elsewhere in south Asia. However, the precise origins of this plant seem to be unknown and it is apparently now unknown in the wild. 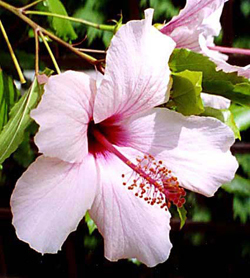 According to some sources it is actually a hybrid of Hibiscus species. The scientific name rosa-sinensis means ‘rose of China’, although it is not closely related to the rose. The tropical hibiscus is now grown as an ornamental plant throughout the tropics and subtropics and is the national flower of Malaysia. The flowers have five brightly coloured petals and, combined with the long pistil and stamen bearing the stigmas and anthers respectively, are recognised everywhere as one of the symbols of the tropics. Tropical hibiscus can be grown under glass in cool climates but must be kept warm in winter, preferably at not less than 10˚C, at which temperature they survive and just ‘tick over’ during the winter months. I learned that one of the major commercial centres for these plants was in south Florida. It so happened that my sister was living there at the time and I had been planning to pay her a visit. The following summer I flew to Miami, drove down to Homestead and was introduced by my sister to one of the many hibiscus growers in the area. I was fascinated by the huge range of form, size and colour of the flowers produced in his nursery and selected some to be sent to me for cultivation in Bristol. In addition, I collected different hybrids (cultivars) from other countries. Growing them in Bristol was initially a challenge, but gradually I learned about the importance of using the right soil and water, how best to feed them, how to deal with pests such as whitefly, how to take cuttings and propogate them successfully, how to get them through the dark, cold days of winter, etc. I ended up with around 35 different cultivars, but have now reduced the collection to just over 20. Although it seems there are very few people growing tropical hibiscus on any scale in the UK, I note that two or three specialist plant nurseries here now offer these plants for sale. I hope very much that Hibiscus rosa-sinensis becomes more widely grown in the UK than at present; I certainly find its cultivation a most satisfying hobby that constantly reminds me of the time I spent in West Africa. Right now (June 2016) I have a number of young hibiscus plants grown from cuttings taken from my plants here in Bristol. They will commence flowering this summer and if any reader of this is interested in growing these plants in their conservatory or a warm/hot south – facing window, please contact me. You will see the ‘Contact’ button at the top of this and other psges. Most of the photographs in the following Photo Gallery were taken in my conservatory in Bristol. View the Photo Gallery – please note that these images and captions are designed to display on a desktop or laptop computer for maximum effect; they may not display in the same way on a tablet or mobile.